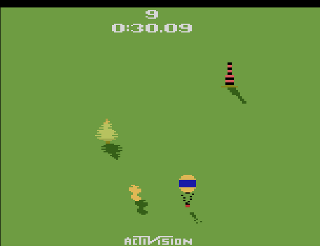 Similar in principle to slalom skiing, in Sky Jinks you race through a pylon course in a stunt plane, weaving left and right around pylons while avoiding trees and hot air balloons. The object of the game is to complete the course as quickly as possible. A stopwatch starts as soon as you take off, but for each pylon missed a 3 second penalty is incurred. After 25 pylons, the end of the course is reached and your final time is displayed, at which point the game comes to an abrupt end. Sky Jinks comes with 5 courses that are selected using the “game select” switch on the console, as the courses are played completely independently of each other. Most racing games have some sort of minimum time that has to be achieved in order for the game to advance to the next course or stage, and this game would have been better served to adopt such a scheme. At the very least, I would have preferred for the game to move onto the next race once each course was completed. The game as-is feels awkward in it’s apparent pointlessness, as an entire game of Sky Jinks can last less than a minute, depending on the course flown. Furthermore, once your game ends, you have little incentive to hit the reset button and give it another go. Your plane handles well, and holding down the fire button on the joystick acts as a high gear, giving you more speed. The graphics are simple but pleasing to the eye, and the simulated airplane engine sound effect sounds good. Still, above-par audio-visual attributes are not enough to save this game, which feels more like a VCS tech demo than a full-blown game. Buy Sky Jinks on GameGavel or Amazon. Tagged 2600, Activision, Atari, Bob Whitehead, Racing, Review, Sky Jinks, VCS. Bookmark the permalink.